In the past few years local multiplayer games have gone from being under represented to there being plenty of options for gamers. Games like Sportsfriends, TowerFall, and Samurai Gunn have all been spectacular, which raises the bar for future releases. The latest game looking to crawl into this space is Golden Ruby Games’ Extreme Exorcism. Does it manage to do enough to keep your attention away from the games that are already released, or does it fail to live up to the high standards of other games on the system? 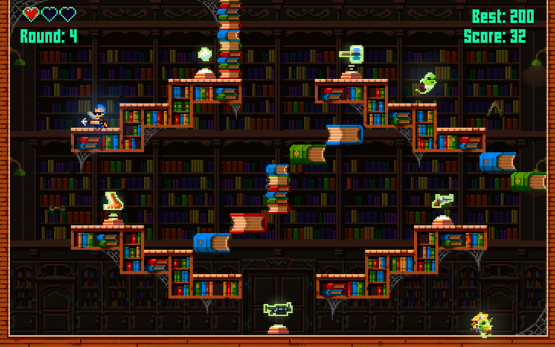 Throughout the arcade mode of Extreme Exorcism, players will be tasked with going into a haunted area of a scary mansion to defeat a haunted chair. With weapons ranging from ninja stars to bazookas, it isn’t very hard to achieve this initial goal. After defeating the haunted object, a ghost that follows your own trail appears and must be exorcised. This repeats endlessly until the player either loses three lives. And that is basically the hook of Extreme Exorcism. Players need to plan their own movements because they’ll be battling themselves over time. It sounds like a really neat idea in theory, but once you understand the concept the game becomes too easy to plan for. Since the game isn’t very difficult in the arcade mode (although it actually gets more crowded and difficult if you play with multiple players), it’ll require players to survive several rounds to see the next environment. This means on later levels, players will have to successfully defeat more than 10+ ghosts to continue on. This isn’t as much difficult as it is an exercise in tediousness, but since the player dies in one hit it requires perfection from the player. Extreme Exorcism is a game built upon repeating itself, but is never really that much fun to play. After you realize that the arcade mode is just solving the same puzzle of not trapping yourself into a corner, it loses a lot of its appeal. This is a shame since there are some pretty neat mechanics in play, especially with how Extreme Exorcism handles weapons. Players can pick up to three weapons at once, which makes them all fire at once. This can lead to some pretty neat combos, but also leads to unhelpful ones so players will need to watch what weapons they run over. The weakest mode on offer in Extreme Exorcism is the single-player challenge mode. The overall concept is sound, you need to defeat ghosts under specific conditions, it just falls back on the game being too repetitive. So no matter what stipulation the player is presented with, be it only using one weapon at a time or only using harpoons, they are largely solved with the same strategy. The main appeal of the game, at least in theory, is in its deathmatch mode. Here up to four players can compete for exorcist supremacy. It takes all of the concepts presented in the main game, weapons stacking and ghost trails, and applies it to a standard deathmatch. While this initially seems like a great fit, it is too complicated for players to immediately pick up and play. The key to any great multiplayer game is that anyone can grab a controller and immediately start having a blast. Sadly, the depth of Extreme Exorcism needs to be known before players can fully understand what they need to do. Deathmatch isn’t as simple as just killing the other characters, so players will want to know why they keep dying from these ghosts constantly flying around the screen. It becomes a frustrating learning experience, and one that left my friends asking to play Sportsfriends instead. That is a huge problem for a game designed to be played in multiplayer. And it mainly shows its head because there are so many better games in the same genre on PlayStation 4. If Extreme Exorcism was released as a launch title, then it wouldn’t have to be looked at in the same vein as TowerFall and other superior titles. Sadly, it was released in 2015 where the bar has been raised. 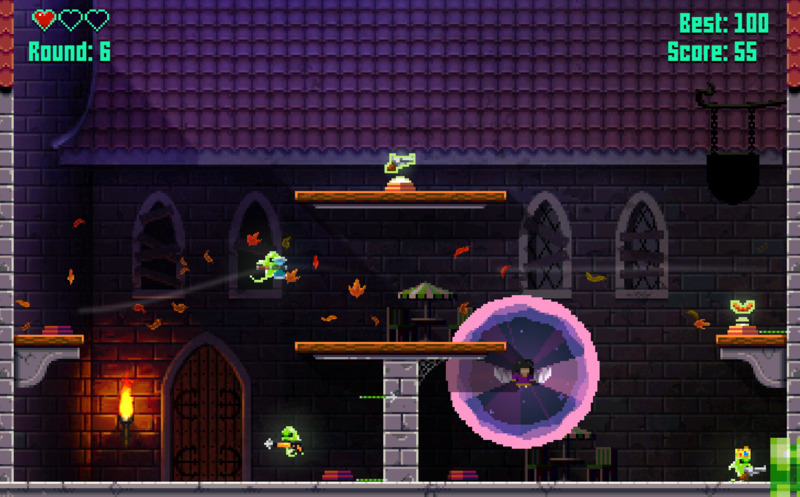 Extreme Exorcism isn’t a bad game, but its core hook fails to captivate players from the get go. With so many amazing games currently available, new releases need more than just a cool idea to stand out. Sadly, Golden Ruby Games haven’t fully realized their title, and it is more enjoyable in concept than in execution. Overall, Extreme Exorcism doesn’t have the pick up and play quality of other games in the genre and fails to captivate audiences. Why play this when there are much better local multiplayer games already out?